The Hans Hoyer G10A Geyer Series Double Horn was developed with the aid of performing artist and teacher Orlando Pandolfi of the Hackley School in New York. The G10A Series features a .468-inch bore combined with a Geyer wrap and gold brass leadpipe designed for excellent response and intonation. This horn also features a detachable, medium-throat yellow brass bell and adjustable thumb lever and finger hook for player comfort. 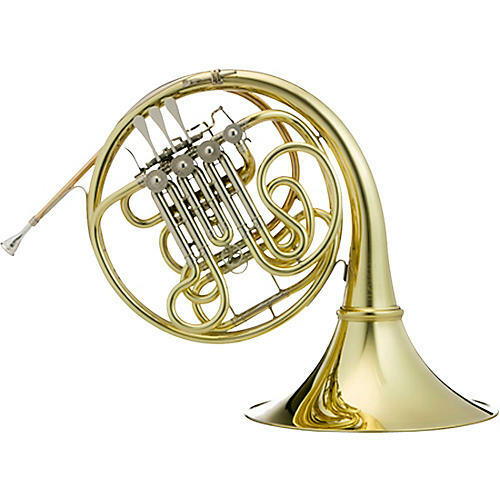 This Hans Hoyer G10A Geyer Series Double Horn includes a case and mouthpiece and is available in lacquer finish with string linkage (G10L2A). The configuration of the G10 based on an original design by Carl Geyer, who at the age of 15 apprenticed as an instrument maker in Markneukirchen where the Brand Meister Hans Hoyer is still being made today. In 1903 Geyer brought his fine German craftsmanship to the United States and soon became the premier master horn builder in the U.S.